If you see 6-4-3 do you know what that means? How excited do you get for October baseball? I’ve been a baseball fan since before I can remember. My earliest recollection of baseball was when I was about 3 1/2 and got my first real baseball glove and ball. The “love of baseball brain washing” probably started even before that. At 4, all I wanted to do when Dad got home was play catch. “One more, Dad, one more!” was commonplace in our front yard. When I was 6, I played in two t-ball leagues at the same time in neighboring towns. Little League All-Star teams were what I did on the summer weekends; High School baseball consisted of 10th grade brawls against our rival team, drag bunts, and running 60 poles as a “disciplinary measure” for having too much fun after getting swept in 2 games on a road trip. But how do I claim to be a TRUE baseball fan? and how does this even relate to eCommerce and online marketing? Read on! 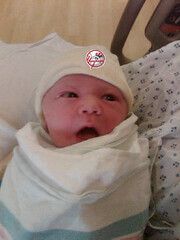 Nate Moller - Yankee Fan! The Importance of the Start: I have a picture, on my 4th birthday, of me in the best baseball helmet I’ve ever worn – a New York Yankee helmet! Hard to call me a “band wagoner” with this proof. Being a fan of the Yankees has always just been in my blood I guess. Getting a good start with an online business is crucial too. In online marketing, I was mentored by an SEO expert – a “New York Yankee” of online marketing who is also a great friend. He taught me the ropes, got me going, and continues to share tips and tricks. We also engage in friendly Twitter smack talk about the best team in baseball! Persistence Pays: The thing I love most about the New York Yankees this year as opposed to other years is their fight to the very end of every game. “The Yankees had 51 come-from-behind wins in the regular season and 15 walk-off wins.” That never-give-up attitude is going to win them the World Series tonight too! (and it DID) Online marketing is very similar. Getting rich overnight is a theory at best. There is no such thing as a true “get rich quick” process online that I’ve found. (Shoemoney has attempted to share a few get rich quick ideas :).) No matter what you’re doing with your online business, it’s going to take work and persistence if you want to have true success. Yes, the success can come quick if you work with the right people, but WORK is one of the key ingredients. How do you measure up when it comes to a true baseball fan and a Online Marketing Professional? Are you going to have what it takes to get that “base hit” in the last inning? Which “Big Players” have you been following? Are you persistent enough to “fight the good fight” and get your site to the top of Google? I look forward to a great night in baseball and a good report on how you’re implementing what you learn in your online business building! Thanks Nate for adding me here to this great list of peeps. Nice way to tie in your Yankees in yet another post too 🙂 hahaha keep the good posts coming bro! It’s always nice to talk baseball smack with you! Thanks for all your help and advice! Thanks for the comment and all you do for social media. It’s fun to have a fellow social media friend who loves baseball too! Some day you might see the “Baseball Light” Monica! You’re welcome to add others you recommend.